We are a one stop solution logistics company servicing Worldwide with our Trucking and Ocean shipping service. In using our freight services, we will negotiate a competitive freight quote using over 5000 different carriers who are certified and contracted by us. We have all equipment types available daily, service all freight types, and have no limits Worldwide. Secure Auto Shipping makes sure that your heavy equipment is shipped safely to it’s new destination. We’re equipped to handle all oversized transports, no matter how large. 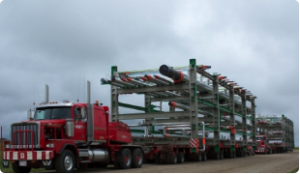 Direct flatbed trucks, step deck trailers, low boys and extendable drop trailers are available for your shipment. Get a free Heavy Equipment quote below or call toll free (844) 243-4350 and speak with an oversized transport specialist.